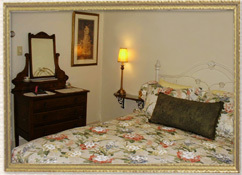 The Garden Side Room features a queen-size bed. 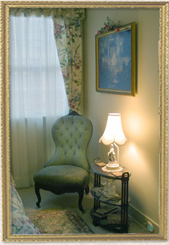 The room boasts antique Victorian furnishings. It is bright and airy by day, quiet and cozy by night. The Garden Side Room also provides a private entrance surrounded by a garden deck. 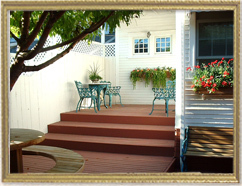 The enclosed, private deck features a large shade tree with wrap around picnic table and bench, large cedars, and several flowering planter boxes. 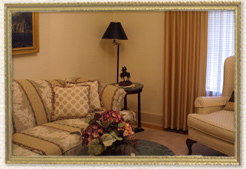 It is a quiet, comfortable retreat from the hectic city streets. The Fire Side Room provides old world tudor-style warmth and charm. It features a single bed, a large fireplace with true divided-light windows that overlook the outside enclosed deck. Savour a generous end-of-the-week, full gourmet breakfast served every morning in the dining room. 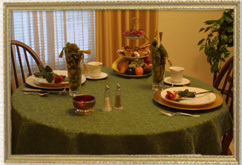 This is a delectable last-until-dinner, culinary experience, where you will be pampered with home-baked creations and quality cooking, using local, fresh products and produce, as are seasonally available. Reserved exclusively for guest use is a comfortable sitting area beyond the dining room where one can relax away from television, computers, and telephones. All lighting fixtures are antique, as are many of the furnishings. Antique art graces the walls, and small Persian carpets are scattered throughout. well-manicured garden adorned by flowering, hanging baskets. Turn down and make up service provided. Before retiring, surrender to a soothing bubble bath in a genuine antique claw foot bathtub, or savour a complimentary sherry in the private sitting room while enjoying musical melodies of your choice.